The Altstadt and Carlstadt make up the historic core of Düsseldorf. In addition to the impressive architecture, these two neighborhoods are also home to excellent local shops, restaurants, bars, cafés and experiences. Are you ready to find some new favorites? Let’s go explore! Bakery Hinkel stands for traditional craftsmanship baking. They work sustainably using all-natural sourdough and live up to their motto: „The Bread-lover’s Bakery”. Their speciality of course is baking bread, specifically rustic breads with hearty crust. Carlsons is a chic new café in Carlstadt offering tasty coffee and delicious food options, including homemade wraps, sandwiches, soups and more. A great place to satisfy your craving for coffee and your appetite all in one spot. If you’re in the neighborhood on the first Thursday night of the month, drop in for their After Work Tapas event. Craving chocolate? If you’re anything like us, the answer is always yes. Gut & Gerne is an excellent artisan chocolate shop that carries a range of products from some of the best chocolatiers in the world. This is the place to enjoy a wide variety of fine cacao, freshly baked cakes, and hand stirred hot drinking chocolates. The team at Bob & Mary travelled around the world to bring the perfect smash burger to Düsseldorf. Savor a fresh and juicy burger with fries and homemade sauces in a stylish atmosphere. There’s also a wide selection of drinks from craft beer to wine and even bottled cocktails. Café de Bretagne has been voted one of the best seafood restaurants in Germany. Stop by to enjoy excellent cuisine and fresh seafood, including oysters, lobster, fish & Breton specialties direct from the world-famous Parisian Rungis Market in a Mediterranean atmosphere, or place an order for take away. Menta specializes in authentic Italian pasta & stone oven pizza made using fresh ingredients. Enjoy a glass of wine or a refreshing Spritz creation in a relaxed setting. More delicious dishes & wines on the blackboard in the restaurant. Now with two locations in Düsseldorf. Casita Mexicana in the Altstadt serves authentic tacos, burritos, quesadillas, fresh guacamole, and a variety of other tasty Mexican dishes for lunch and dinner. Also serves homemade lemonade, a selection of Mexican beers and cocktails. Spatz Up serves delicious, handmade Swabian Spätzle (egg noodles) using natural, regional products based on an original recipe. If you’re in a hurry, meals are also available to go. At ARTSERVICE + TUBE you’ll find affordable material for art, graphic design and architecture modeling. There’s a large selection of products for everyone from beginners to professional artists, hobby artists and students. Should you have questions, helpful advice is always available. Beuys Bar specializes in state of the art mixology and good vibes in a stylish space. Here excellent drinks are mixed by an award winning team. Also hosts events such as Back to Basics, featuring top DJs the first Wednesday of each month. The Irish Pub Bei Fatty was established in 1978, making it one of the oldest Irish pubs in Germany. Order a drink and soak up the fun, lively atmosphere. There’s always something new to keep you entertained, from televised sports matches to dart boards and special events, including traditional Irish music. Holy Craft Beer Bar is the first bar of its kind in Düsseldorf. Here you can enjoy over 100 flavorful craft beers, including 12 on tap, while relaxing on a Chesterfield sofa, pallet bench or on the terrace. Also visit the Holy Craft Beer Store at Friedrichstr. 79, which stocks over 300 varieties. The FFT offers a unique artistic program featuring performance, dance, theater and concerts at its two venues. It dares to experiment, push boundaries and ask questions about social developments, pop cultural phenomena and local events. 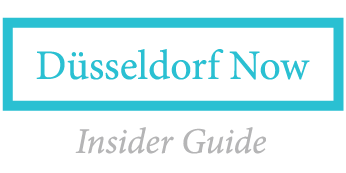 If you liked this neighborhood guide, check out the others for Pempelfort/Derendorf, Unterbilk/Bilk and Flingern.